After sitting in my garage for the past 8 mos. (i'm lazy) the S4 bumper is finally on. Last edited by ianlionzion; 01-13-2005 at 08:05 PM. congrats. mines been in my garage for 3 months now probly be summer before i can paint it and put it on. agh, how could you be lazy? man, i could've been sporting it for the past 8 months for you..
it looks nice. i love the rs4 mod. Looks great and very fast. But then everyone knows black is fast!! ian what wheels are those? thx everyone. i'm pretty happy how the rs4 mod turned out. ben - they are sportec mono 10's 18x8.5. Where did you get the grille from? Is that the standard S4 fog light brackets and lights? 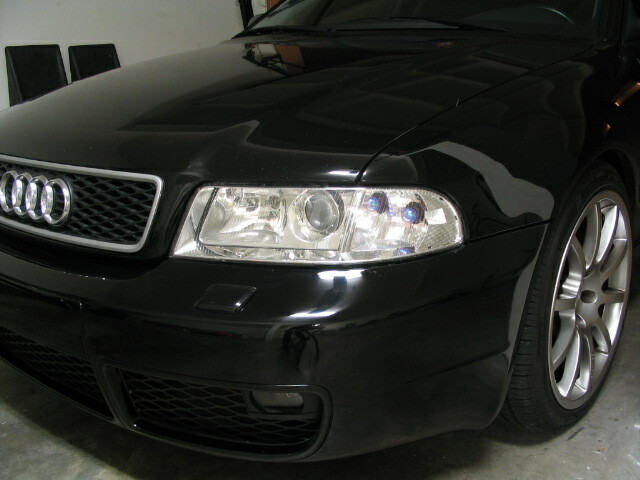 I used OEM RS4 mesh. normally, it's expensive, but I found a guy on e-bay and convinced him to sell to me. so I got 4 center panels for the price of two. Yes, I am using the standard S4 fog lights and brackets. Last edited by ianlionzion; 01-13-2005 at 10:37 PM. I had no idea the Rs4 mesh fitted the S4 bar. I'm looking at upgrading mine later in the year. i'm gonna cut the centers out in the spring. After the wintert the bumper wil need a respray anyways. another black A4 with S4 front. looks sweeet ! damn...that's great!!! the rs4 mods looks killer! Lat: 38Âº45.06'N Lon: 009Âº16.32'W Portugal!!! meshes look great on the S4 bumper! great job! black is fast! Alu Roof Rails, Alu Mirrors, S6 Door Blades, 19" Gallardo Reps, S-Line Sport Seats, S-Line gear knob, NavPlus+DVD. looks good. Is that the "quattro" badge? thx everyone. it is the 'quattro' badge. had to dremel it to fit. Last edited by ianlionzion; 01-14-2005 at 11:23 AM. Looks killer you are inspiring me to get mine put on...had mine sitting out back for 2 months now. 2004.5 USP A4 1.8t with mild mods. 1956 VW Bug with major mods. Looks GREAT!!! I love the RS4 mod! That is inspiring me to convert my S4 bumper over! One thing, have you thought about painting the grille surround black too? I think it would make everything look more uniform. Either way, looks great though!!! Paris Hilton says: "Thats hot". how'd you put it on the grill? it's OEM RS4 mesh. got it pretty cheap off a guy on e-bay. that's the only reason i used it. otherwise i was planning on using expanded aluminum mesh. Any pics during the build stages? Looks really nice..especially in black! 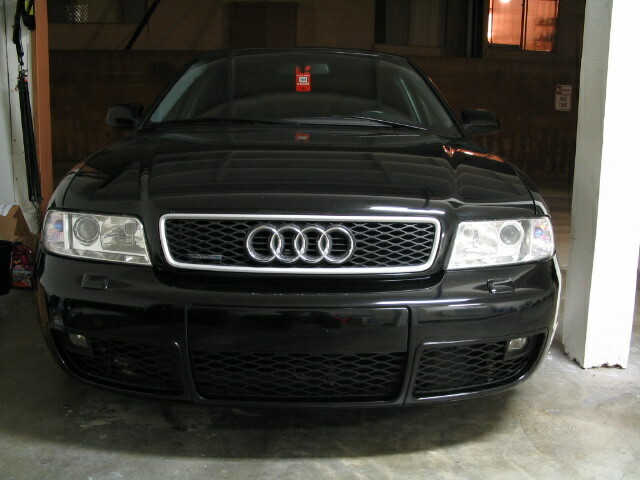 you think you can buy theis emblem, shave it down and mount the Quattro badge to it to fit in the RS4 mesh grill? Why would you want to put an RS4 emblem on your A4?